If you drive a car here in Windsor, chances are you noticed that the price of gasoline jumped yet again last night. The gas station at the corner of Wyandotte and Lauzon was selling gas at 129.9 cents per liter. It all seems to be coming true… That’s why I’m pleased to introduce my new baby! 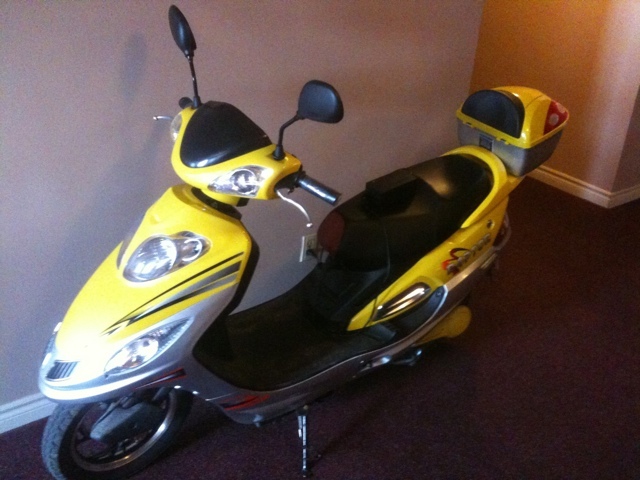 She runs on electricity, gets 50-60 kilometers on a charge, and she’s a fun ride to boot! Not to mention that she’s likely to pay for herself in a matter of months. Admit it: you want one too. This entry was posted in Uncategorized and tagged economy, Fuel, peak oil, price. Bookmark the permalink.